A Utah city was recently fined for allowing youth under the age of 16 to work later and longer than permissible under federal law. While child labor laws don’t often make major headlines, this begs the question: Is this an isolated incident or do businesses still struggle with child labor law compliance? Turns out, it’s the latter. For example, in January of 2019, a Wausau, Wisconsin, Subway franchise owner was fined $47,000 for allowing 55 employees, who were ages 14 to 15, to operate baking and toaster ovens — duties that are prohibited by law for their age group. These employees also worked beyond the allowable 8 hours on non-school days or 3 hours on school days, which is a violation of the Fair Labor Standards Act (FLSA). This isn’t the first time a Subway franchise has been in the news for child labor violations. In 2012, a Subway franchise with five different Ohio locations was sued by the Department of Labor (DOL) for “allowing workers under the age of 18 to load, operate, or unload paper balers or trash compactors, which is prohibited under federal law.” In a separate incident, a 15-year-old worker at a Subway in Littleton, Colorado, who was routinely scheduled to close the shop at 10 p.m., was murdered while working outside of legally permissible hours one night. Child labor laws exist to keep young workers safe. Hour restrictions serve the same purpose, while also helping to ensure teen workers have time to focus on school (their primary job) rather than work. Problems arise frequently when scheduling managers and/or business owners aren’t aware of the restrictions. At Magic Springs theme park in Hot Springs, Arkansas, this resulted in violations of hour restrictions when young teens were scheduled to work beyond the 3 hours on a school day, more than 8 hours on a non-school day, after 7 p.m. on a school night, after 9 p.m. on a non-school night, and for more than 40 hours per week during the summer. A Michigan Wendy’s franchise was hit with a $250,000 fine for similar DOL violations incurred at 53 of its franchises. These violations centered around the employment of 422 youth workers ages 14-15 who had been tasked to work manual deep fryers (prohibited) and scheduled to work more than the permissible 8 hours on a non-school day and 3 hours on a school day. At Stratus.hr, one of our roles is to oversee regulations, including child labor laws, to ensure our clients’ business practices remain within the law. 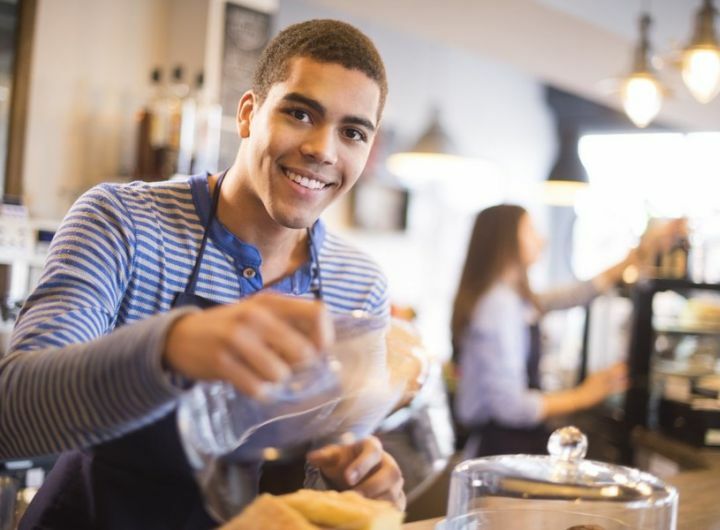 To simplify the process for businesses, we’ve put together a simple reminder of what the regulations surrounding the employment of teen workers are. You can download the Teens at Work infographic here. Can only work between 7 a.m. – 7 p.m.
Can only work between 7 a.m. – 9 p.m. Remember that some states have more restrictive laws than the federal standard. Any time there are both state and federal laws regarding employment, the law that provides the most protection to the worker is what must be adhered. Please contact our HR team for any specific questions you may have. Problems arise with child labor law compliance when scheduling managers aren’t aware of restrictions. For more information about Stratus.hr’s services and/or to request a free demo, please complete the form below. Stacey is a certified Professional in HR (PHR) and the reason her clients would never consider leaving Stratus.hr. When not at work, you can hear her at one of her children’s sporting events -- she’s the one whistling louder than the refs.